PHILLY is increasingly known as a vegan-forward town, with places in most neighborhoods where you can enjoy an animal-free dinner or lunch. Recently, a friend staying in town overnight asked for a good weekday vegan breakfast spot, and I was stumped. Partly that's because I tend to be at my house at breakfast time, and partly it's because breakfast flies under the radar: You don't think about it that much until you really need it. I posed the question on the Web and got some great info from fellow vegans and "vegan-friendlies." To review: Bacon, eggs, sausage and Spam are off. Most cereals are vegan if topped with a kind of milk (e.g. almond, coconut, flax, soy) that wasn't swiped from a grieving mother. Same goes if topped with a non-dairy yogurt. And remember, you can't make an omelet without exploiting chickens. In a pinch, just about anyplace has some form of fried potatoes that might be made with vegetable oil if you ask, and probably a fruit cup, but we're looking for menu items in unabashedly vegan territory, such as tofu scramble. A cousin (stepcousin?) of scrambled eggs, this concoction employs turmeric as a flavor as well as a coloring agent, adding peppers, onions and sometimes tomatoes, spinach and/or mushrooms for a wake-up dish that looks vaguely egg-like but is more full-flavored and less greasy (just add olive oil if you need that effect). 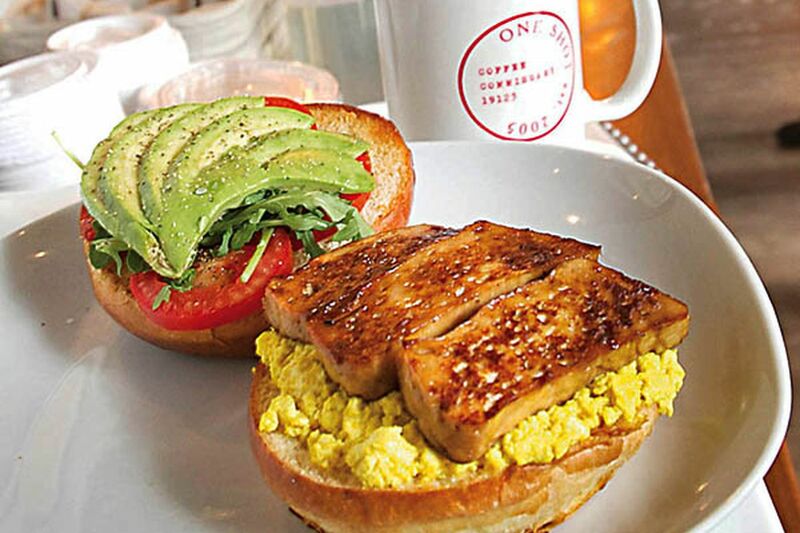 A surprising number of places around town offer vegan tofu scramble. The folks at VegPhilly tipped us to Black & Brew (1523 E. Passyunk Ave.), the Gold Standard (4800 Baltimore Ave.), Honey's Sit 'N Eat (800 N. 4th St.), Sabrina's (1804 Callowhill St., 910 Christian St. and 227 N. 34th St.), Sam's Morning Glory (735 S. 10th St.) and Vegetate (3210 Chestnut St.). Note that these aren't vegan joints, but they're taking the commonsense step of including dishes that will appeal to vegans and curious nonvegans alike. Some go even further: One Shot Cafe (217 W. George St.), for instance, has multiple items paired with a vegan bacon that's made in-house. Wow! Talk about an eye-opener! One Shot co-owner Melissa Baruno explained that this "house-cured" concoction is made fresh every day. It has a flavor profile that mixes maple-derived sweetness with a somewhat salty, smoky flavor to create a "bacon" that doesn't precisely mimic the regular stuff but works as a great stand-in with their Avocado Toast, along with other dishes. Of course, there are also store-bought varieties of "fakin' bacon," which hit the market quite a while ago and have been constantly improved (coconut is a surprisingly good starting point) to near perfection. Jeez, what's next in the march of progress: vegan bacon grease? For now, the product is available on the Web via veganessentials.com, but it should be on Philadelphia shelves by summer. It's good to keep in mind that the standard "balanced breakfast" we used to see on the back of cereal boxes is just one version, whether you're veganizing or not. A lot of us mix it up, literally, with breakfast smoothies (ginger is a good component for eye-opening zing), soups, fruit salads and even vegetable salads. I confess that I'm still evolving on this, partly due to morning laziness, but more to my coffee habit. If for whatever reason I'm dining out for breakfast, I might skip coffee - especially since true nondairy creamer is still not stocked in every venue - and go a more adventurous route. Or I could order vegan pancakes at Vegetate (3210 Chestnut St.), or vegan waffles at The Abbaye (637 N. 3rd St.). Some might ask, why even spotlight vegan versions of stuff like bacon and eggs (yes, there's even a vegan sunny-side up "fried egg" now)? It's simple: Vegan foods are for everybody, not only the already vegan. As a new animal-free paradigm slowly creeps over the horizon, many people are still gradually opening their eyes to the dawn. If you're one of them, these analogs of well-remembered comfort foods are "breakfast in bed" - something you can enjoy while in the process of awakening. So, relax, enjoy, fortify yourself. Then get up and greet the new day. Vance Lehmkuhl is a cartoonist, writer, musician and 14-year vegan. "V for Veg" chronicles plant-based eating in and around Philadelphia. VforVeg@phillynews.com or @V4Veg on Twitter.